To help test the toxicity of new drugs, NIBIB researchers have engineered a 3D brain organoid—a miniature organ structure that attempts to mimic the function of the organ but does not develop fully. In a paper published in PNAS, the teams from the Morgridge Institute for Research and the University of Wisconsin-Madison describe how they developed a chip with neural tissue that possess many traits of brain tissue, including neurons, support cells, vascular structure and immune cells. In these images researchers have tagged various types of neuronal phenotypes in the tissue engineered 3D brain after 21 days of growth. In recent years scientists have developed tissue chips that include tissue from liver, lung, and heart tissue in order to test the effects of potential new drugs on human tissue before proceeding to clinical trials. Pre-clinical animal testing is usually conducted before moving on to humans, but animals don’t always respond to drugs in the same way as humans and toxicity to human organs can be overlooked. Clinical trials are expensive, so the ability to test for potential negative effects on human tissue before beginning clinical trials can save millions of dollars. Drugs are already being tested on human cells in the laboratory, but often drug toxicity cannot be predicted based only on their effects on cells. Organs like the brain involve complex interactions between blood vessels, the immune response, and the cells themselves. The 3D organoids developed by the researchers combined all of these components to create a miniaturized version of human brain tissue. Progenitor cells are cells that are similar to stem cells but instead of the ability to become any type of cell, they are already predisposed to develop into a particular type of cell. In order to create these small brain organoids, researchers needed both the correct cells and a fertile environment. In this case they used progenitor cells derived from human pluripotent stem cells. . For the lush environment, they used a hydrogel. The hydrogel, a molecular scaffold, creates a structure and environment that facilitates the assembly of the progenitor cells into a 3-D human tissue. The resulting “brain-on-a-chip” was then tested with 60 different chemicals, some of which are toxic to neural tissue and others that are not. The computer model trained to look at the results was able to accurately identify whether the chemical had produced toxic or non-toxic effects 9 out of 10 times. 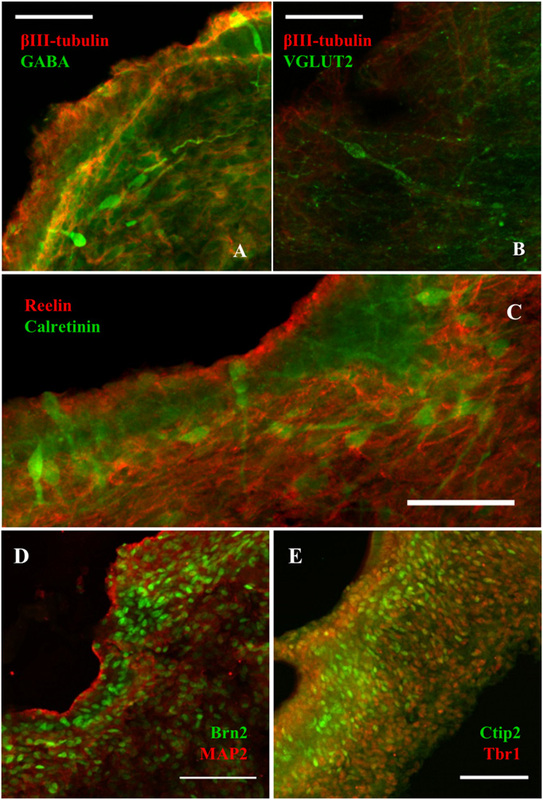 The vascular network of the tissue engineered 3D brain is tagged so that researchers can differentiate the endothelial cells (in green), glial cells (in red), and nuclei (in blue) after 21 days of growth. “The tissue assembly process for the synthetic hydrogels was highly reproducible, which opens up a wide range of opportunities in drug discovery, toxin screening, and disease modeling,” said William Murphy, Ph.D., Professor, Biomedical Engineering and Orthopedics. These results, while still in the beginning phase, are very promising, according to researchers. It is possible that in the future, organs on a chip could play a significant role in reducing the cost and improving the safety of drug approval.